I rarely describe a recipe I've created as heavenly but this one fits that title. 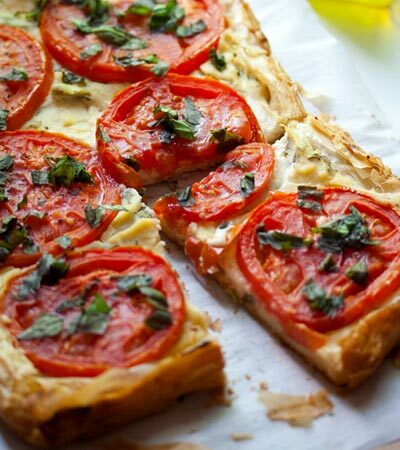 You have the light and crispy Phyllo dough mixed with the creamy white center. Then the tangy flavor of the basil and tomato hits your taste buds. So good! Want to know what others thought about this recipe? Would you like to comment on this recipe? Go to the Heavenly Tomato Tart blog entry. Cut Tomato slices and sprinkle with a little sugar, lemon pepper and sea salt. Prepare the cream by placing tofu, garlic and onion powder, lemon pepper, sugar, sea salt, olive oil, vinegar, arrow root into a food processor and process for 1 minute. Then add 1/2 of the basil this and stir it in. Save the rest of the basil for sprinkling on the top. In a small condiment dish or coffee cup mix together butter, olive oil and garlic powder. Spray cookie sheet with olive oil and lay out 1 sheet of the phyllo and with a pastry brush, lightly brush the olive oil and butter onto the sheet.Repeat this process until you have all 12 sheets. Spread cream filling on top of this, leaving a 2 inch margin around the phyllo. 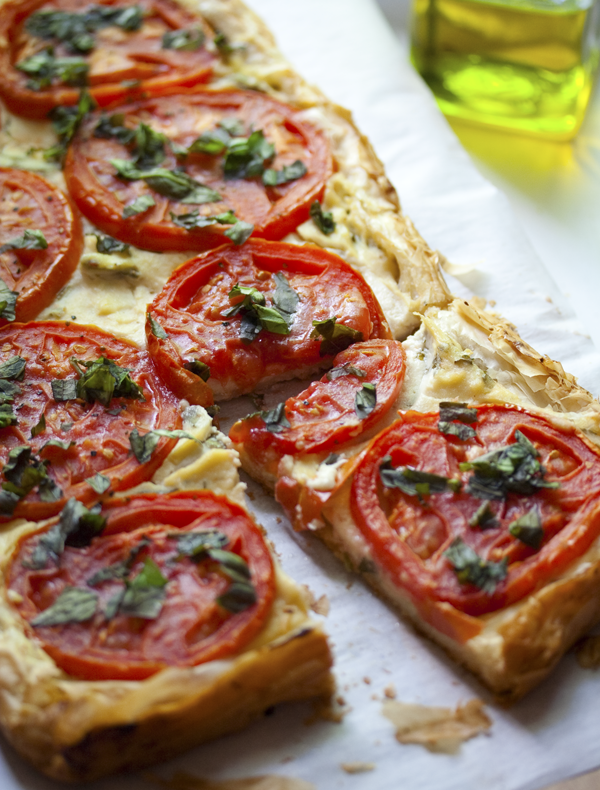 Place the tomatoes on top and brush with the remaining olive and butter, then sprinkle with the remaining basil. Fold edges up. Place in oven, uncovered and bake for 20 minutes. Serve warm or at room temperature.